In the midst of a series of rainy days, it was quite easy for general malaise to become boredom, then all-inclusive griping. What was there to do? Watching paint dry wasn’t possible. Grass and mold continued to grow with each passing shower. Griping was something, once started, had no end. Last year, continuing into the current year, my laptop developed issues. Frustrating to me–summarized, in chronological order. 6-1-17: The craziness continues. Can’t search, even from home page. 8-5-17: Wi-Fi quit working–Oh, what fun! 8-6-17: Cooling system problem. Warning–return for servicing. 8-9-17: No internet. 8-15-17: Slow internet. 9-12-17: Still stuck in mud. 9-14-17: Ditto. 9-15-17: More of the same. 9-19-17: No home page. AOL briefly came, then went kaput. 10-23-17: Updated internet security, then everything went wonky. 10-26-17: After security update, frequently visited sites, couldn’t be visited. They’re suddenly not secured. Perhaps I should contact Mark Zuckerberg, as suggested, ask him to update FB security, so my laptop will work properly? Fat chance of that happening. 11-13-18: Couple of days of reasonably good internet. 12-3-17: This laptop may as well be a brick–can’t access the ‘net. 4-20-18: Internet down since 3 PM. 4-28-18: I’m on line, I’m off line–which was it? 6-26-18: Overheating issue repaired. Slow internet, on fringes of wi-fi unchanged. 8-4-18: Sketchy wi-fi, but no searching. 8-7-18: My old friend “invalid network configuration” popped up out of the blue. 8-14-18: Briefly accessed entry page. 8-15-18: Entry page accessed even more briefly than night before. I should explain–my laptop functioned normally in the house. Why did I put up with such difficulties? Challenges never stopped me before. Maybe complaining had the cathartic effect I needed? You didn’t have to say it. You were thinking it. 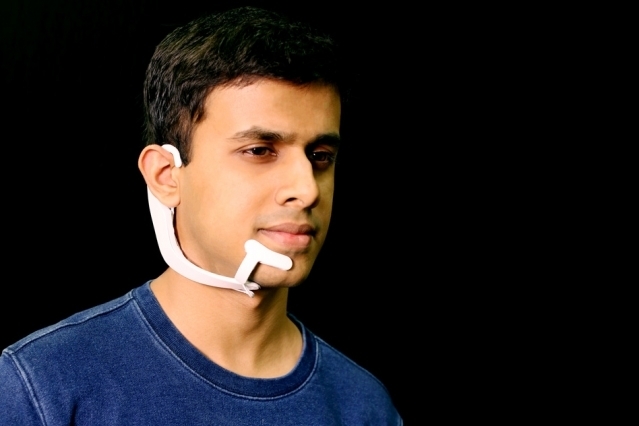 Scientists at MIT developed a wearable electronic device purported to “hear” inner speech. It’s officially called the “Alter Ego” headset. Billed as an “intelligence enhancement” device. Electrodes pick up neuro-muscular signals in the jaw, triggered by internal verbalizations–saying words in ‘your head’–but were undetectable to the human eye. So far, the system has been used to do fun things like navigating a Roku, asking for the time and reporting your opponent’s moves in chess to get optional countermoves via the computer in utter silence. …Motivation was to build an IA device–intelligence augmentation device, said MIT grad student and lead author, Arnav Kapur in a statement. Pardon me for being skeptical. The “what if” part–what if this were to get in the wrong hands, for the wrong reasons? It didn’t seem like much of a stretch. Detected non-verbalized communications are called “subvocalizations.” I would prefer to keep my subvocalizations to myself. I don’t know about any of you, but I could use more intelligence. I suppose that if both parties in a conversation were equipped equally, there wouldn’t be much need to communicate out loud. Your significant other wouldn’t ask, “A penny for your thoughts?” Because they would already know. Should we watch what we say and think at this point? Only clean words and thoughts? Not that we shouldn’t strive for that, anyway. Return trip delayed one day, and an unexpected trip to the auto repair shop. Everything covered by warranty. As was often the case, no problems were found at the auto shop. The service advisor and myself concluded, that an automatic light control switch had been inadvertently turned off. Who/what was to blame? Speculation would be pointless. There’s enough incompetence to go around. After this post-Thanksgiving verbal meandering, I would offer the following words of advice. When visiting grandma and grandpa’s house, please return electronic devices to their original settings–that includes automobiles. Thanks in advance for your cooperation. Author warturoadam77pPosted on November 30, 2017 Categories absurdities, admonitions, competence, humor, UncategorizedTags grandparents, technologyLeave a comment on Arise–Fellow Incompetents! Where oh where did the post I wrote yesterday evening go? It’s lost, orbiting somewhere in cyberspace. No doubt, the evil Dr. Smith from “Lost In Space” was involved in its demise. Nobody liked those automatic shoulder harnesses that snugged around one’s neck and shoulders. It was too much like being held hostage. What if synthesized warning car voices resembled those of mothers, mothers-in-law, or backseat drivers in general? I don’t anyone would check the box for that option–too much like real life. Automatic emergency braking, blindside monitoring, lane departure warning systems, make backseat driving unnecessary. Dr. Smith stay away from my car! What light through yonder window breaks? Why, it’s our long-lost friend the sun. It’s a good day for conclusion jumping, claim jumping, line jumping, leap frogging, frog jumping; any other kind of jumping–for those so inclined. Makes me tired just thinking about it. Beating the bushes for story ideas–at the same time, careful not to overlook the obvious. Fingers didn’t move as fast as my mind worked. That will never change. Sometimes I feel like the guy that spoke several languages; didn’t understand any of them. Technology changed the world–changed the way we do things. Made the world seem smaller. In spite of advances, human nature never changed. There’s comfort to be found when things don’t change too drastically, too quickly. I despise planned obsolescence, which seems to occur faster-and-faster. I’m older, like to reminisce. Only people of my generation can relate to the same experiences. On some days, I feel like a twenty-year-old, trapped in a sixty-eight year old man’s body. Other days the opposite is true. In the old days, we didn’t apply superlatives to everything that happened. What would happen if a termite were taped to a splinter to remove it? Re-blog from three years ago. The problem is not better, if anything, it’s gotten worse. There are even more passwords. Then, there’s the issue of password security.